As part of my generally not very successful life and career post Sauder MBA, I had to move, putting all my stuff in storage until I can find a permanent job. My job search has continued to go very poorly and I don’t have any answers or fresh ideas on where to apply or what type of position I would finally be “the right fit” for. Anyway as part of my move I had to take all my painted minis out of the three glass Ikea cases I bought for them and put them somewhere. I own several miniature cases. Some I’ve my made myself. Some I’ve adapted from gun or computer cases. 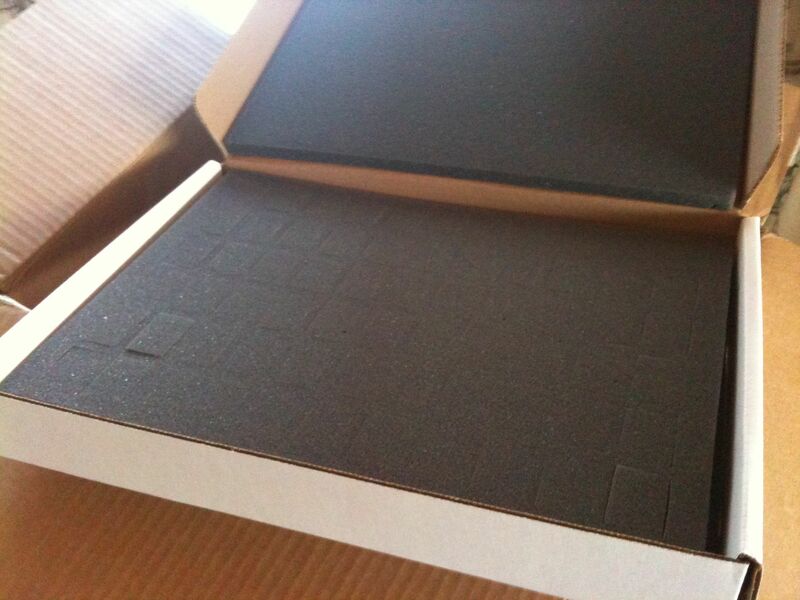 I’ve cut my share of foam and I’ve bought cases from GW and Charon. I don’t play much, haven’t played a miniature wargame in well over a year, see first paragraph for the reason why. But when I do play I usually need about 1500 points maybe 2000 which works out to about 40-50 guys plus a couple tanks and walkers or if I’m playing fantasy more men but less big models. I got my customized Charon case to hold just about anything, since then the truly custom laser cut foam has come on the market. 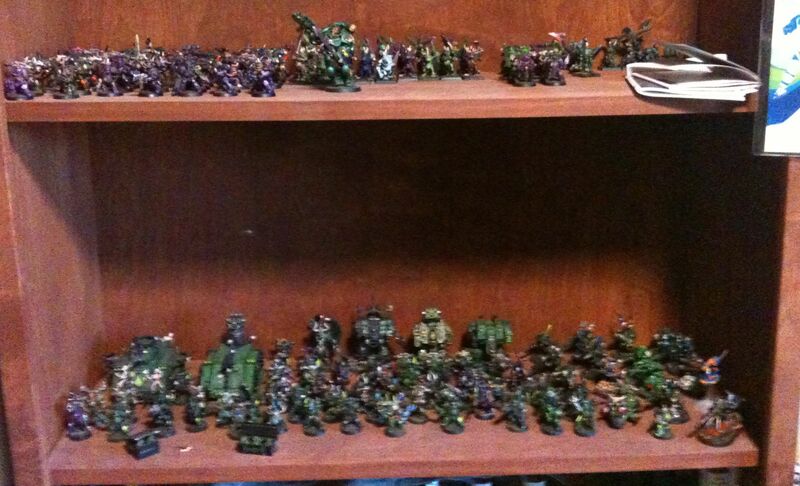 I may get one of those cases someday, cut to match my next army, if I ever do a next army. But in the mean time I discovered I didn’t have enough cases, especially good cases with nice mini-specific foam to move all my models at once. So I ended up moving them in stages. I filled up the Charon case and maybe the GW case and moved those models to my mother’s house, then later I brought back the empty cases and moved the rest of my collection using every case I had. I thought about buying some more foam or a dedicated miniature case then, but I didn’t want to rush my purchase decision and I’m well past broke from being unemployed for so long, so movement expenses were being kept to a minimum. Several months have gone by and my minis have sat on a shelf I cleared of books or in a case in storage at my mom’s house or in a storage locker on Terminal. It was recently Christmas and my 36th birthday so I got given some money and not wanting to spend it, I didn’t. However I keep reading more books and need that shelf space back, my mom’s house has too much stuff in it, and miniatures just sitting on a shelf are at risk so I bought some econo miniature cases I read about online. I got 5 of them from the War Store for 50 something dollars and I bought two more Sabol Design foam pieces that I can use to store the bigger more awkward models. The econo boxes are the bigger ones, the so-called Fuzz Boxes. They can hold a lot of models for about 10 bucks, but the spaces look a little small, now that I have them in my hands, especially for Chaos Space Marines. 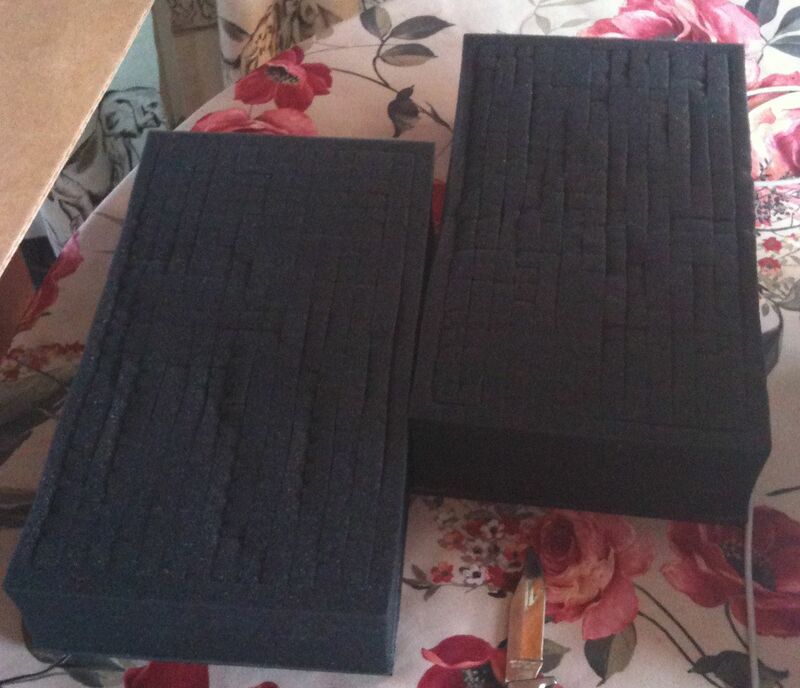 I’ve previously cut GW and Charon foam to make room for spikes and big guns and it is possible to get larger foam cutouts, but not this cheap. The budget boxes are all one size fits all. I may get out the scissors, I also may repack the Charon and GW case as they have some goblins in them, Goblins are much smaller but spear goblins are difficult to pack none the less. 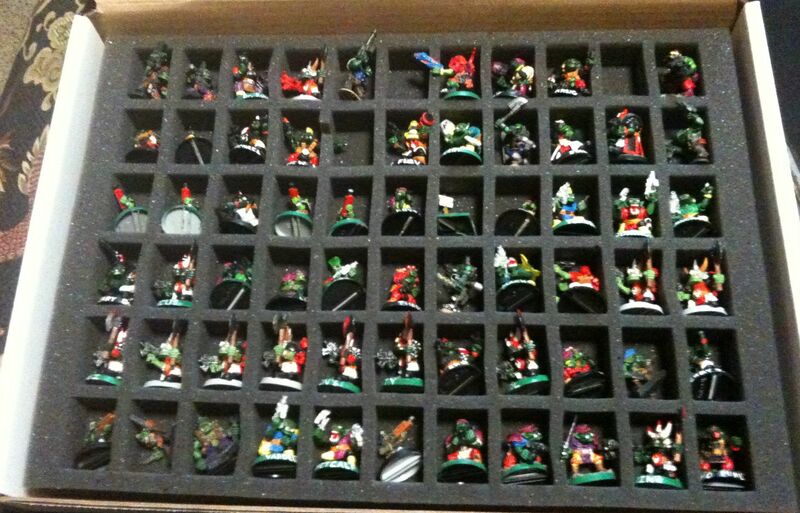 Most of my 4th Edition Warhammer Fantasy Battle spear goblins are in a rifle case at the back of a storage locker. The archers and misc. 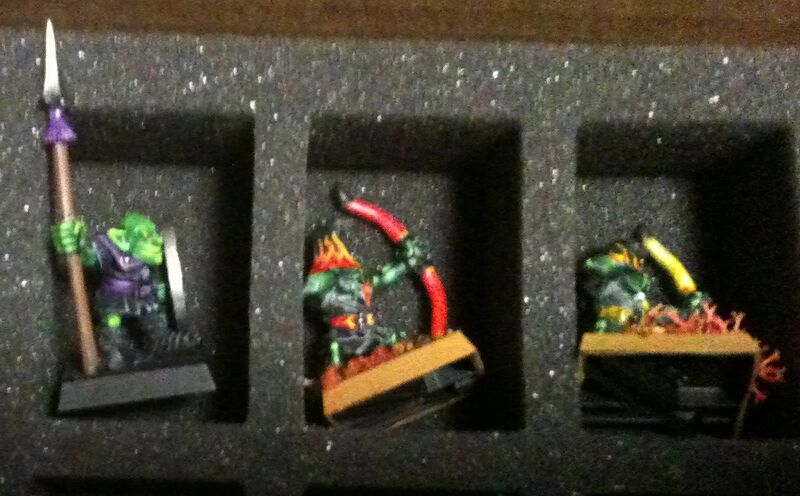 other goblin models may be repacked into these econo boxes. Some day I may have the money and space to have dedicated foam, if not a dedicated case for every model. As it is I’m unemployed, and many of my models never even see the table top and many had not even seen the outside of a miniature case until I bought the Ikea cases and put almost every model I ever painted on display in my apartment for no one to see. A few days later I brought all or most of my miniature cases into my bedroom at my mom’s house and tried to figure out which models would fit best in the new foam. As I suspected the old GW goblin archers fit best. 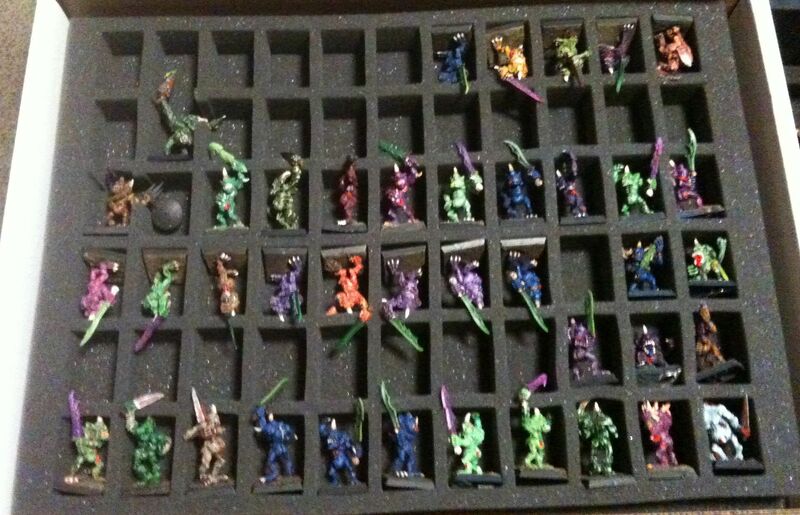 I have two units of those, the spear goblins are in storage in a rifle case but you can see from the photos how they fit less well. My old Rogue Trader era and 2nd Edition Space Orks fit pretty well in the budget foam cases and the other models that got volunteered are my one piece metal plaguebearers. I cut the odd little gap but I couldn’t safely fit my big spikey Chaos Space Marines in the budget boxes. I also couldn’t make enough room for them in my Charon Productions and GW foam. I used the Sabol foam to make my three dreadnoughts a home. I need a better long term solution for my orks and goblins, my Silent Death space ships, and models on 40mm round or square bases or motorcycle bases. 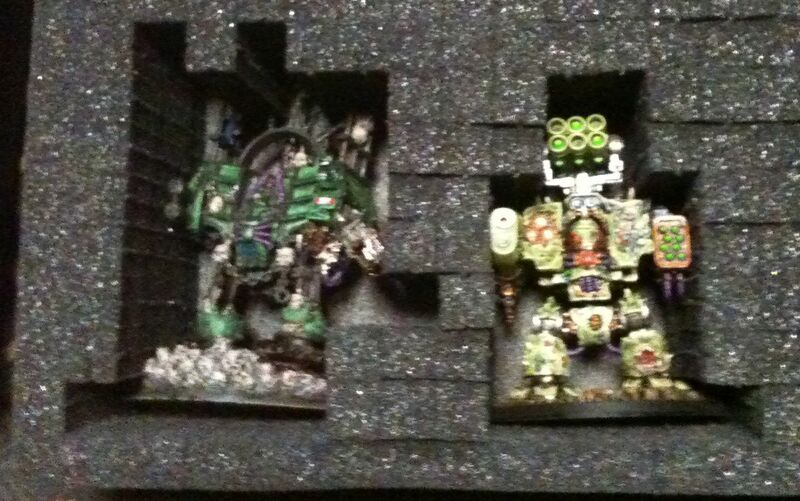 My ork models like that are in an old tool box I’ve lined with foam, but my Chaos Space Marines are just too numerous. I have one piece of Charon Productions foam that has larger spots, but an even better solution is needed. Whether that involves pluck and pull foam, custom cut foam, or just ordering more specialty foam, I don’t know. I don’t know if I’ll ever start another army or even ‘improve’ the two old ork and goblin armies. I’m out of practice painting and my life is not going well so time for hobbies I do not have. Everything will set in storage as is at my mother’s house for the foreseeable future. 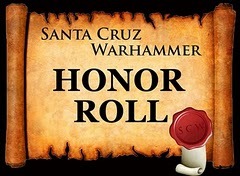 Maybe after sixth edition comes out, I’ll dust off the Diseased Sons and the Nefarious Fire and play some games, but I’m not optimistic I’ll get a lot a use of my miniature collection in 2012 or even 2013.